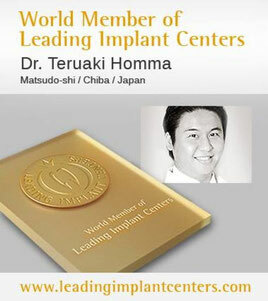 World renown dentist in Isumi Chiba. Dr. Teruaki Homma earned his DDS degree from Nippon Dental University in Japan in 2004 and a post-graduate residency in 2005. Dr. Homma worked in private practice until enrolling in the Advanced Program for International Dentists in Comprehensive Dentistry (2007) completed at NYU. He then enrolled in the Advanced Program for International Dentists in Implant Dentistry (2009) and served as a Clinical Fellow in Implant Dentistry (2009-2010). Dr. Homma is currently the Vice President of Shimmatsudo General Dental Clinic and President of Chihara Dental Clinic, the Director of ADIA, Japan and the Future Implantologists Study Team (FIST). Dr.Homma currently available on Tuesday morning and Friday afternoon. Please make an appointment for any kind of trouble you have.